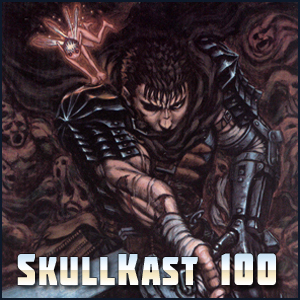 The SkullKast crew — Walter, Aazealh, and Griffith — play through all of the 1999/2000 Dreamcast game "Berserk: Chapter of the Flowers of Oblivion" (JP) / "Sword of the Berserk Guts Rage" (US). This is a pretty great game, but it's not very easy for everyone to just jump in and play. We wanted to talk in-depth about it and demonstrate how closely it adheres to the overall tone and feel of Berserk, so a video-podcast is the best way we could figure that out. Listen to the podcast for a teaser of the full thing, and find the YouTube video of our playthrough here. Wow impressed you guys we’re able to beat the game in under 3 hrs! Was that standard for DreamCast games back then or is the Berserk DC game shorter than average? It was a VERY short game for its time. I beat it in about three hours my first time through it, and subsequent replays took a little less than one hour (due to skipping cutscenes). It's a short game, and I wasn't really playing for speed, but I did put it on Easy so I could focus on talking instead of expertly mowing through enemies. That was a fun and interesting new take on the podcast. Heh, I didn't even realize it was released before the Conviction arc was even finished! I thought the only real preview it had for readers was Casca's return to lucidity (and that was a long ways off), but it really hinted at a lot of things to come, like Guts and Casca's reunion, Griffith's return, and his formation of an army of Apostles. The game may not have aged well, but it still looks leagues better than the 2016-2017 anime. Shows how a little expressiveness in the character models and a lot of proper cinematography can go a long way. Shame you failed this QTE, though, because the success is just as amusing. That was a fun one. Im sure you guys already thought about it, but you should really also upload the SkullKasts on youtube. Im sure that there would be interest for them on that platform. That was great! I have never played this game and it was very fun watching you guys play it and listen to your thoughts about it. I also have to agree that it's probably the best Berserk game. When I started reading the manga and since I have a PS4 I wanted to buy the "new" game, but it didn't look that good... Did you guys like/dislike the ps4 game? Honestly, the game looks pretty good and playable even for today standards. Too bad, I don't own a Dreamcast console or a PS2(anymore) so I can play none of the two. Like people said, it's a very short game to begin with. But more than that, it's just very unique. It's very narratively-focused, heavy on cutscenes, and with a visual fidelity that was pretty impressive back when it was released (December 1999). It was also the first game to ever feature "Quick Time Events", as we mention during the podcast. It's really more of an interactive movie, but with actual good gameplay in it. A kind of hybrid that's unlikely to be made again. When I started reading the manga and since I have a PS4 I wanted to buy the "new" game, but it didn't look that good... Did you guys like/dislike the ps4 game? I haven't even bought the new game... And I own a lot of Berserk-related stuff. I think that answers your question. The Dreamcast game remains uniquely relevant to Berserk today, and while the PS2 game was less meaningful, it was a well-executed, fun romp. The Musō one was just a cash-in, a Berserk skin applied to a gameplay that hasn't changed in 20 years. I did a little audio impressions thing back when it first came out. Not a big fan. I just love the aesthetic of this game... Sweet memories. I love that you guys did this! Really fun podcast, and it worked well with video. I'd never seen this full story and it added a new layer onto the story.